That’s just barely in the “Advanced” ranking and a long way from “Expert”. 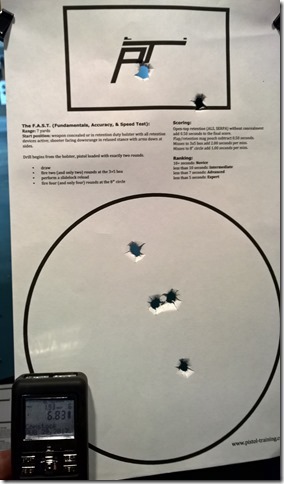 I shot about four or five practice targets before I got one where everything was working reasonably well. The slide lock reload is really painful. In action shooting I try to always plan my reloads so I never go into slide lock and frequently reload with half full magazines in the gun when I’m on the move between shooting positions just to make sure I avoid the slide lock. The reload time shows my lack of practice. I always hesitated as I started to engage the target again before I racked the slide. I think I can do better on the first shot too. I can see shaving 0.50 off my time without too much effort, but getting to “Expert” may be beyond what I can accomplish. Since it takes two hands to rack the slide to chamber the round, consider using your offhand thumb to disengage the slide lock instead. I’m assuming you shoot righthanded. If shooting left, use your trigger finger to drop it. If it can’t be moved with a finger or thumb, it needs to be adjusted to fix the problem. So, you start with two rounds in the gun so the slide locks back after two shots? I don’t understand. What’s the painful part? Blipping the slide back so it drops the slide lock? Or do you mean that it’s “painful” in a psychological sense, as in, “listening to Ted Cruz’s voice is really painful” or, “sitting in a traffic jam when I’m late for work is really painful”? You can’t reach over the top of the slide to yank it back…because there’s an optic there, or what? I wouldn’t mess with the locking notch on the slide as Will seems to suggest– That’s turning the gun into a special little snowflake race-gun that will more readily fail to lock back. It’s “painful” in the sense it takes time for me to think about it and rack it after putting a fresh magazine in. My brain is pretty much hardwired to start shooting once the fresh magazine has been seated. I have to think about it rather than just running on “automatic”. If I practice it so that it becomes more automatic I can probably save something on the order of 0.5 seconds. I do not think that the F.A.S.T. Is supposed to be practiced. It is a test not a drill. You go out there, take the test, do a little critical thinking between the timer and the target, then you tell yourself “This is what I need to work on”. Retake the test at a later date. I think you are doing yourself a disservice by shooting the Test that many times and then looking at the best one. I believe it is designed to be a baseline of what you can do on demand.